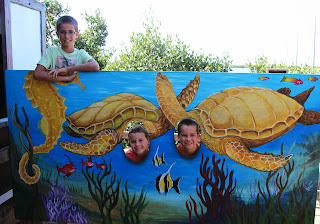 Our second visit to the Sea Turtle rescue center was much warmer than our first! We got to see all the turtles and learn about why they are there. All of the turtles were rescued from the ocean close by and they get rehabilitated until they are ready to be released back into the ocean. A few of the turtles are missing flippers and won't be released back into the ocean. This turtle is missing 3 flippers and has a prosthetic flipper. Gary was ready to pose with the boys again!